2,000+ articles touching on every subject in the Bible with contributions from over 250 evangelical Bible scholars. Imagine yourself…captivated by a dictionary! A Bible dictionary is an essential resource for anyone who studies the Bible. Who has not at one time or another wondered at what “Hellenism” is, or what was meant by the words “Expiation” versus “Propitiation”? This Bible dictionary answers questions like these and is an indispensable tool for effective Bible study, providing immediate access to background information, definitions, outlines and theological information. Bible times and characters will come to life! The Holman Bible Dictionary will start you on the path to applying the Word to your life. Such understanding gives depth and consistency to Bible interpretation, enabling the student of God's Word to believe and follow its teaching with confidence and intelligence. Each entry provides an excellent synopsis of its subject in the first sentence so that, if you don't have the time for in-depth study, you'll have a quick answer at your fingertips. Then it guides you to a complete study of a subject with handy cross-references to the Bible and to related articles. For example, if you look up the word “Menorah”, you get links directly to the Bible text as well as links to additional articles. The articles in the Holman Bible Dictionary were written by over 200 contributors from diverse evangelical persuasions and national backgrounds over a 6 year period. The list of authors includes Barry J. Beitzel, W.A. Criswell, Charles Lee Feinberg, Walter Kaiser, Jr. and many more. The dictionary was written to communicate well to everyone who uses it. And although all the writers are highly respected scholars in their fields, each one was asked to write so that everyone could understand the message, avoiding scholarly pontification. As you use PC Study Bible , you're sure to find yourself consulting the Holman Bible Dictionary for information of all types. PC Study Bible's SmartReferences™ will let you know when it has something to say on a passage or subject you are studying. And once you open a dictionary article, it will be easy to continue your research on the subject at hand because of its handy cross-references. Just click on the article name and PC Study Bible will take you there instantly. The Holman Bible Handbook , by David S. Dockery, General Editor, provides the Christian community with a comprehensive guide for understanding the Bible and appreciating its significance for the contemporary world. Its goal is to help the student of God's Word to understand the overall meaning and message of the Bible. It provides practical guidance by offering helpful answers to questions and difficulties that sometimes arise when studying the Bible. Like a commentary, the Handbook expounds the meaning of every major section of the Bible. Like an encyclopedia, the Handbook surveys matters relating to the nature of Scripture, theology, church history, and world missions. Like a dictionary, it defines, identifies, and clarifies numerous topics in over one hundred feature articles. And the material, written by a vast array of evangelical scholars, has a warm, easy-to-read style with laypeople, Sunday School teachers, and beginning Bible students primarily in mind. The Holman Bible Handbook is like 5 reference works in 1! 1. The Bible includes articles describing, in accurate yet clearly understandable terms, the name, characteristics, inspiration, authority, unity and canonicity of the Bible. 2. 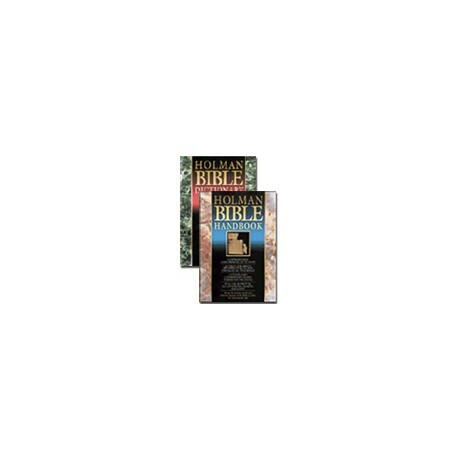 The Bible in its World offers carefully written articles on the cultural, geographical, and historical background of the Bible and the societies into which it was introduced. 3. The Bible in the Church presents articles on how to read, study, teach, and preach the Bible. Included is a section on how the Bible has been used and applied throughout the history of the church and appropriate uses and application-principles for today. 4. The Bible and its Message comprises about two-thirds of the material in the handbook. Here are found running commentary on the entire Bible and analytical outlines for the comprehensive study of God's Word. 5. The Bible and the Christian Faith offers insights into the meaning of the Bible and its role in contemporary culture and individual lives. Articles touch on topics such as Christian doctrine, church history, world missions, ethical and moral issues, and family relationships.